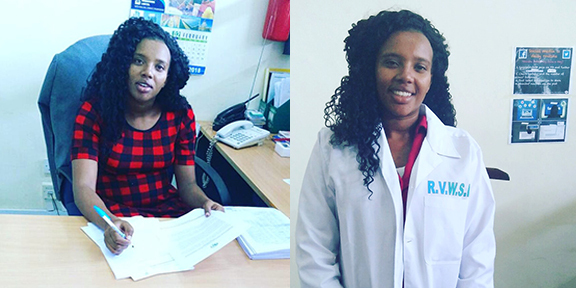 Joy Kakenya Barta has secured an industrial attachment, a work-based experience program which allows students to develop specific or generic skills, valuable to their professional development, at Rift Valley Water and Services Board in Nakuru. They provide efficient, adequate, sustainable and affordable water supply and sanitation services. She will be working there, in the corporate communication department, for three months, while still attending classes. She’ll be planning workshops, writing letters to stakeholders, preparing internal communication, writing reports, and much more. She is scheduled to graduate by the end of 2018. Elizabeth Kironua Sakuda finished her industrial attachment at Ewaso Ngiro South River Basin Development Authority and is also in classes and scheduled to graduate by the end of 2018. She’ll receive a bachelor degree in environmental studies. Sabina Tumeki Siankoi is continuing with her studies in gender and development. The other women in the program are doing well too.